While the nearest ocean is hundreds of miles away, Lake Michigan puts Chicago on the map as a prime destination for fresh fish. From divey shrimp shacks and fast-casual fish eateries to seasoned steakhouses, we’ve still got plenty of options when it comes to finding lobster, crab, shrimp, mussels, oysters, and everything else that looks funny on dry land. 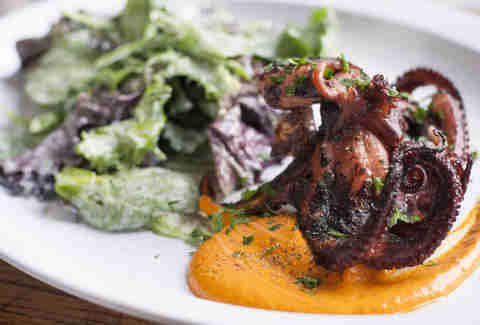 Whether you’re looking for fried, pan-seared, smoked, grilled, broiled, or raw dishes, these are the 20 best restaurants in Chicago to get your seafood fix. 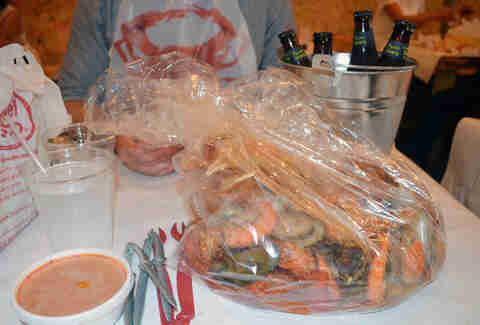 Some friendly advice about this little, Cajun-style seafood joint in Rogers Park: even if you’re wearing the lobster bib, things will get sublimely messy. The BYOB restaurant serves up some of the freshest seafood in the city (think giant, spice-encrusted crabs and plump shrimp immersed in garlic butter) ordered by the pound. Everything will arrive at your paper-covered table tossed together in a big plastic bag with your choice of heat level and spice -- lemon pepper, garlic butter, Cajun, or all three mixed together “maniac!” style. No plates or utensils necessary. Just dig in with your bare hands and start crackin’. The premise at this fast-casual fish shack with outdoor seating across from Millennium Park is simple: pick your fish (like the rotating blackened fish of the day, or salmon and whitefish staples) then pick your style. Straight up, on a "subbie," or in tacos, a salad, or a Powerbox loaded with quinoa, the menu options are fresh, well-prepared, and some of the healthiest quick meals around (lest you dig into a pile of its tasty tots). Like the fish, you’ve got decisions to make for your tots: Classic, Truffle Parmesan, and Buffalo Bleu. 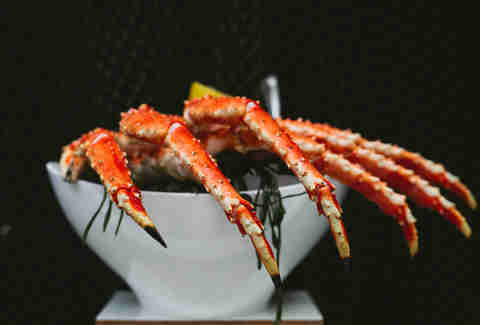 Shrimp and scallop ceviche, ahi tuna tartare, colossal lump crab cakes, seared sea scallops, oysters on the half shell, stone crab, Anchor Steam-battered halibut, jumbo Alaskan king crab legs, and lobster tail are all on this River North steakhouse’s menu for you to feast like a king. By turning one fish case into a dining bar and adding some tables, Bill Dugan has been running an “occasional” restaurant out of his Fishguy seafood shop for years now. In addition to plenty of fresh seafood options by the pound to-go, customers can dine-in with pan-roasted Cape Cod mussels, a fried clam-packed sandwich, fish tacos, “really big shrimp” in an anisette and crab butter sauce, and a killer Cape Breton lobster roll for lunch. 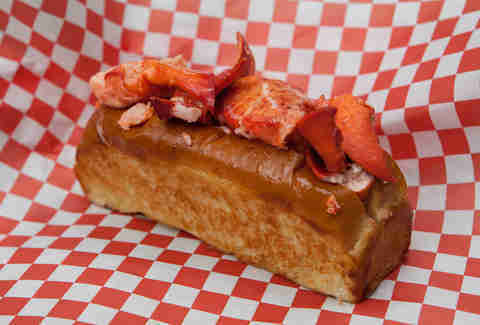 There’s a reason for this food truck’s long line: it doesn't skimp on the lobster. Four ounces of fresh, plump Maine lobster wedged between a soft, burger-style bun instead of the traditional, split-top hot dog bun (which translates to more buttery surface area) is indeed “your Maine source of happiness.” Grab a regular size for $15 or a junior size for $8 to-go. Down some of the Windy City’s finest oysters at this seafood and sushi spot at half the price from 4-6pm daily. 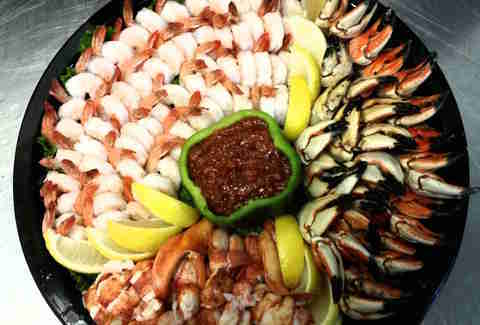 Sample a variety of both East and West Coast bivalves and crack open crab claws from the bar or in the more formal dining room. In addition, its comprehensive Sunday brunch spread includes lobster mac and cheese, hot and cold crab legs, caramelized bacon, decadent French toast, and a hearty meat-carving station. Straightforward seafood dishes like salt-cured, lemon-spritzed anchovies draped over slices of buttery bread, and made-for-two platters like “Cataplana” cobia collar with clams and shrimp paired with a glass of txakoli will prove that less is more at this Spanish-style eatery. Reminiscent of dining in a seaside fishing village, the menu at this bright, garden-level spot named after legendary food writer M.F.K. 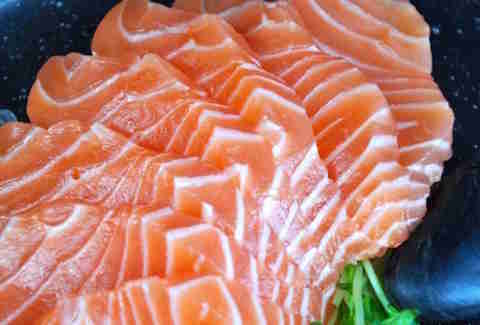 Fisher is uncomplicated and delicious. In fact, its only dessert, a Basque cake that goes well with espresso, is not to be missed. This Humboldt Park joint is on our list of the top 10 shrimp shacks in Chi, and might also be an excellent late-night fried-food contender since you can dine until 2am on Fridays and Saturdays. 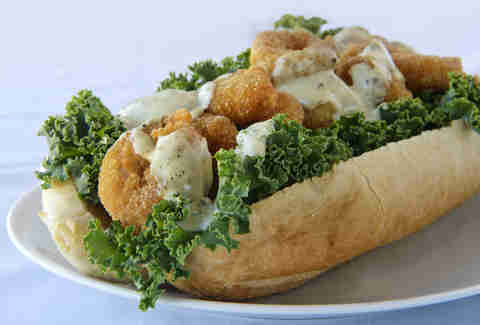 While you should definitely try the massive fried shrimp po-boy, the off-menu Shrimp Jibarito is a sandwich you won’t want to pass up. 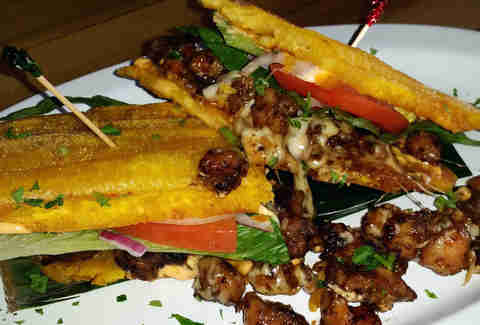 Crisp, fried plantains with a sauteed shrimp filling are made to order for an impressively balanced jibarito. 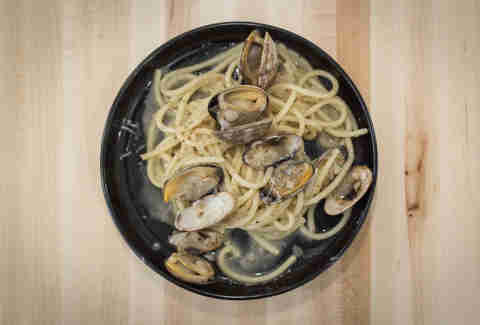 For a quick bite, this Chinatown seafood spot has garnered a loyal following with its Gulf-imported catches since the 1950s. 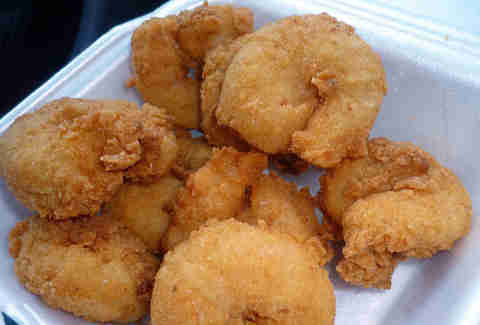 The thicker-style breading on the addictive fried shrimp and fish offerings makes this a go-to restaurant for quality, fast seafood that's available 24/7. 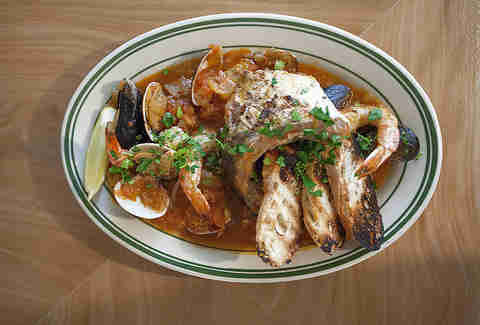 This Italian-style seafood joint flies in fresh seafood daily, and its menu features a giant bowl of mussels, clams, calamari, langoustines, and saffron in a tomato leek broth. Next on the bucket list would be its New England lobster roll or the Chilean sea bass with prosciutto, sage, lentils, and arugula pesto. And did we mention its teamed up with Bang Bang Pie Shop for its biscuit supply? While its Gold Coast location is now a soon-to-be casualty of building demolition, it's still got the River North (BYOB, by the way) and West Loop digs inside the French Market. The quick-service lobster roll eatery serves authentic New England rolls with a twist, including Indian, Asian, Mexican, and Greek varieties. If you’re missing the newly closed shop, you can always get the Gold Coast-style lobster roll with lobster, blue crab, shrimp, and truffle mayo in River North. 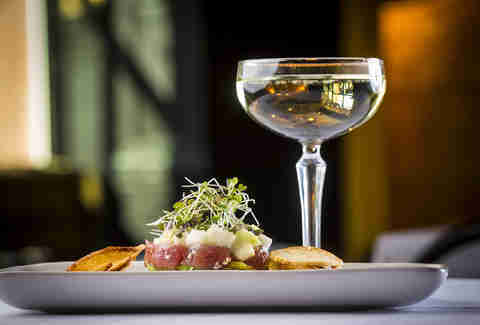 At this old-style riverside tavern with a mermaid mural painted on the ceiling, you’ll want to get shareable plates of tuna poke, savory crab empanadas, and charbroiled oysters, along with the seafood linguini with scallops, smoked trout, mussels, and crispy okra in an Old Bay cream sauce. 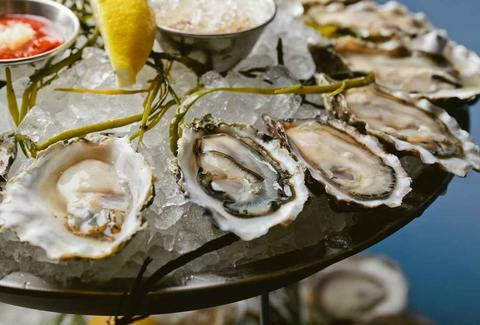 Buying a half-dozen oysters between 4-7pm on Mondays will get you another half-dozen free. Stick with the theme by ordering a Dirty Pearl martini garnished with an oyster. This fine-dining seafood establishment by the restaurateurs behind Girl & the Goat is one of our 20 most romantic restaurants in Chicago AND features one of the best dishes your hangover desperately needs right now. 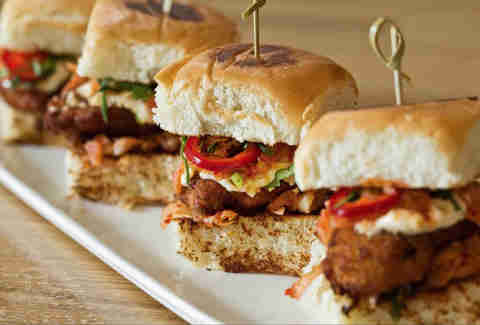 Spend too much time with your hot date over several rounds of expertly crafted Dark & Stormys at the oyster bar, and you might be coming back for round two the next day for its hangover-zapping oyster po-boy sliders. The nautical-themed eatery from the Scofflaw and Slippery Slope guys executes refreshing small bites like oysters ($1 from Sun-Thurs, 10pm to midnight), smoked parsnips with squid ink purée, gin-cured salmon, and BBQ fish collars. For a heftier option, move to the pasta alla chitarra with smoked octopus, beef lardo, black pepper, and red wine as a main course. It also slings seafaring cocktails like the Harpoon Fizz with rye, Cappelletti Aperitivo, lemon, and honey, as well as a gin-based White Negroni with Carpano Bianco and Suze liqueur. This family-owned smoke shack fed hungry day laborers of Chicago’s once-thriving steel industry, and a trip down to the historic waterfront today still offers the quintessential seafood eating experience in a paper bag. 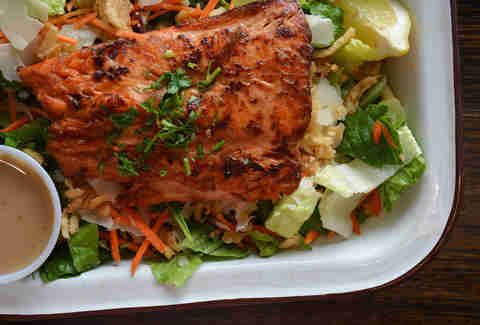 The little white box at the base of The Blues Brothers bridge churns out fried and oak-smoked shrimp, salmon, trout, catfish, and sable -- all of which you can eat while gazing out at the river barges from the hood of your car. 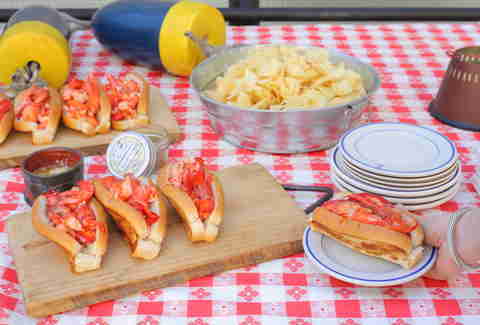 Luke’s doesn’t overdo its delicious, lobster-packed rolls with a heavy mayo or celery base, which is what differentiates its chilled sandwich from all the other restaurants hopping on the lobster-roll bandwagon. But why settle for just the traditional lobster roll when you could go big with one of each type of roll it offers, overflowing with lobster, crab, and shrimp, plus two crab claws to boot? With quirky touches to emulate (or mock) a fish shack, DMK’s seafood outpost dishes up ocean classics with a modern twist. From standard oyster po-boys and lobster rolls, to perfect pieces of rainbow trout and sweet, buttery shrimp, and fennel-and-chili-spiced octopus a la plancha, it serves it all wild caught. With “sea sippers” like the “Three Hour Tour,” a double-rum, guava, and lime concoction, you’ll need at least three hours of imbibing on the patio. Follow up with a slice of Mindy Segal’s Key lime pie. 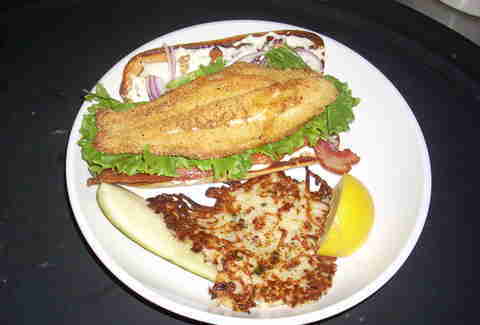 This seafood joint has weekly dine-in specials like $2 Tuesday (think fried pollock tacos with cabbage, pico de gallo salsa, and spicy mayo, paired with lobster bisque and Miller Lites/Bud Lights for just $2 apiece) and an all-you-can-eat fish fry on Fridays for $10.95. 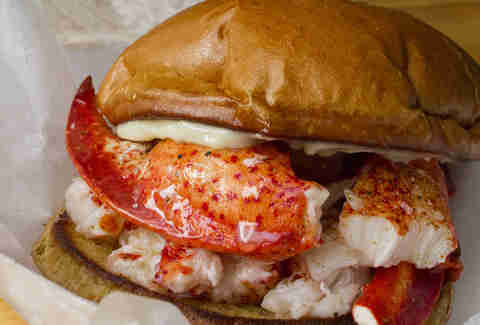 The seafood and buns are flown in from Boston daily, plus you can grab fresh seafood from the market for later. 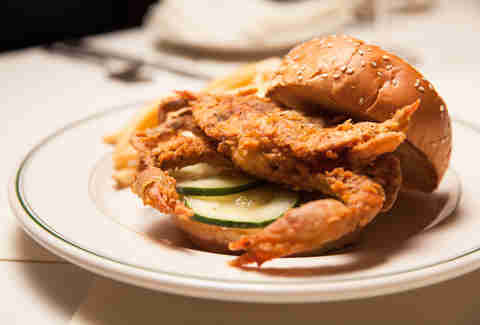 For reasonably priced seafood, this neighborhood restaurant doubles as a fresh fish market specializing in offerings like seasonal catch-of-the-day specials, cornmeal-encrusted catfish po’ boys, “Crabster” Alaskan king crab rolls with hearty portions of hot, seasoned crab, and New England clam chowder with bacon. 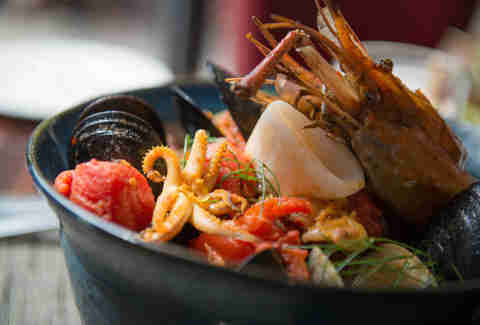 Even the Belmont Ave seafood salad is loaded with smoked trout, king crab, shrimp, and mussels in the shell. 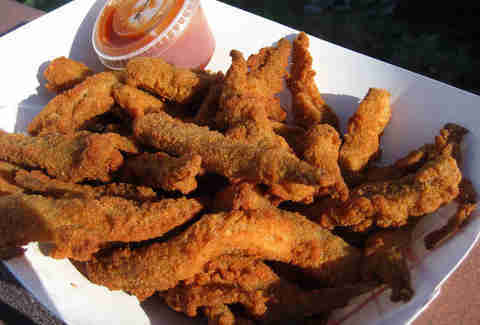 Nicole Bruce is a contributing writer for Thrillist Chicago and is down for an all-you-can-eat fish fry any Friday. Follow her on Twitter at @nicoleabruce.